Description: The flowers are 1 1/2 inches (3.8 cm) wide and have red to lavender-streaked petals. 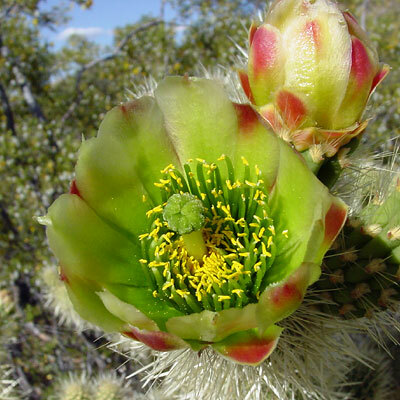 The flowers are followed by bumpy, yellow, narrowly vase-shaped fruit. 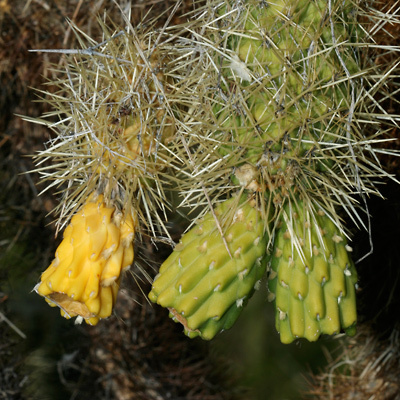 The stems are densely covered in pale yellow, barbed spines. The spiny stem segments detach easily at the joints and will adhere to anyone brushing against them. 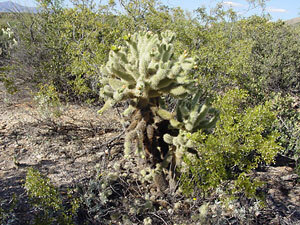 Fallen stem segments litter the ground under the plants, making these cacti especially hazardous to approach. The fallen segments take root in the soil, creating new plants.